First things first, seek out a home that’s a ranch-style home (with one level), or, if you prefer, you can have guest bedrooms and other amenities on other floors of the home. Be sure that every room is easy to access, including the master bedroom and bathroom, the kitchen, the living room, and the dining room. Stairs can be an obstacle, and they may even be unsafe for aging individuals. Even if you have full mobility now, it’s smart to plan ahead with a ranch-style abode. Along the same lines, it’s smart to look for a home with a shower and/or tub that is easily accessible. Look for a home with a walk-in shower that has little to no lip at the entrance of the shower. You may also want to have a shower with a bench to make bathing even more convenient. If you’re looking for a home with a tub, you can search for walk-in tubs that have a door (these tubs are relatively rare, so you may have to have one installed if you find a home that lacks a convenient tub). Be sure that, at the very least, your tub or shower have tacky surfaces at their base. As we all know, a wet surface is slippery! You can also improve the safety of your bathroom by installing handrails to provide support as you bathe. When you’re perusing homes on the market, be sure to take a keen look at the fixtures around the home. Ask yourself: Are the light switches easy to access? Are the faucets easy to use? How about the door handles. 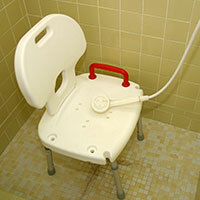 Be sure that you find a home with easy to use fixtures, as mobility can decline as we age. Take note, it’s relatively inexpensive to replace most fixtures throughout a house, so you can still make a purchase if you find a prospective home that is otherwise ideal! Wide doorways, ramps, and other features may be necessary if you have to utilize a wheelchair within your home. Be sure to look for a home with a low-slope or no-slope driveway, doors that are 32 inches or wider, and without stairs. This is an especially important consideration for those that suffer from conditions that affect walking, or those who use a wheelchair to get around. Next, consider the neighborhood surrounding your prospective home. Seek out a neighborhood that is safe, and a neighborhood that has all of the amenities you need nearby. For instance, if you love going to the movies, it’d be smart to live right near a theater! In addition, you may want to find a home in a community where landscaping maintenance is already cared for. You can find neighborhoods that are retirement friendly where landscaping maintenance is included as part of your homeowners association fees (including lawn mowing, tree and shrub trimming, and snow removal in the winter). Finally, you’ll have to consider the cost of your retirement home. Be sure to set aside enough money to retire comfortably. While you’ll want enough living space, and the amenities that you love, you’ll also need to have funds available for all the activities that you enjoy. Look for a home that will keep you comfortable, and be sure to keep enough savings to live comfortably. 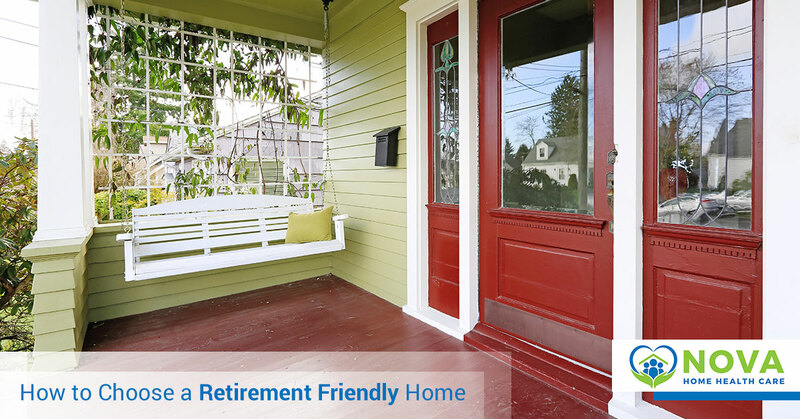 You can speak with a financial advisor to plan for your home purchase and your retirement. If you or a loved one requires in-home care services, we can help. Here at Nova Home Health Care, we strive to make retirement enjoyable, comfortable, and completely convenient. That’s why we cater to your needs and desires all from the comfort of your home. We provide a variety of in-home care services, including nursing services (from our skilled nurses), speech therapy, occupational therapy, physical therapy, dietitian services, post-surgery and outpatient services, and personal care services. Count on our friendly team of highly trained professionals to care for you and yours, all from the comfort of your own home. Get in touch with us to get started!